How can community voices influence major development? 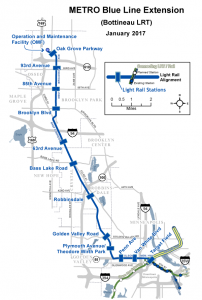 With the landscape of our cities ever-changing, the Metro Blue Line light rail extension is planned to connect North Minneapolis and Brooklyn Park, running through neighborhoods with a majority population of people of color and immigrants. Major infrastructural investments like the light rail extension will impact our communities for decades to come, with economic impacts in the billions. There is a long and damaging history in this country of transit planning and development negatively impacting communities of color, especially historically African American communities. We need look no further than the Rondo Community in St. Paul, decimated by the construction of Interstate 94 in the 1950’s and 60’s when highway planners failed to engage and listen to the concerns of the community. To ensure that this damaging pattern was not repeated, several community organizations came together in 2012 to form the Blue Line Coalition to advocate for community engagement in the planning process of the Blue Line light rail extension. Today, Blue Line Coalition members have seen their impact on the policies and structure of the light rail plans, and in building community capacity. The Blue Line Coalition has created a couple of videos that demonstrate the power of community engagement as a key strategy to advance equity in our communities. Check out the below video for a message to our partners in philanthropy about resourcing community engagement. Watch the below video for a perspective from BLC member organizations on their experience organizing community. Growing Our Team — New Board Members! Nexus proudly welcomes three new members to our Board of Directors: Elaine Rasmussen, Gordon Goodwin, and Jodi Bantley. Elaine is the CEO of Social Impact Strategies Group, a start-up venture whose mission is to democratize access to capital by and for women and communities of color as well as mainstream impact investing for accredited and non-accredited investors. Elaine has also participated in Nexus’ Community Wealth Building Culturally-Based Cooperative Development Technical Assistance Cohort. Gordon is the Midwest Region Project Manager of Race Forward for the Government Alliance on Race and Equity, which is a national network of jurisdictions committed to advancing racial equity by transforming government’s role into being an effective and inclusive democracy. Jodi is the Community Engagement Coordinator for Civic and Community-Based Learning at Metropolitan State University, and has been a long-time partner of Nexus in Community Wealth Building. We are thrilled to bring these leaders’ voices to our Board as we head into a year full of exciting work in 2018! “At Nexus we think it’s very important for people to take vacations to get away, spend time with family or to concentrate on things outside of work. However, you shouldn’t have to vacate your job or the work experience in order to relax and experience a sense of wellness. We believe that wellness should be integrated into the work environment and that people should be able to engage in wellness in addition to any vacation they take.”- Repa Mekha, President & CEO, Nexus Community Partners. A little over a year ago, Nexus Community Partners’ President and CEO, Repa Mekha, took a three-month sabbatical. He spent this time traveling, learning, and reflecting on his ten years of leadership at Nexus. The time away was invaluable for Repa and the organization, and both were stronger when he returned. While on sabbatical, Repa reflected on the importance of wellness, and how too often our organizational structures and cultures discourage staff from taking care of themselves. “I think we often think that not being able to keep on pushing means there is something less about us when in reality, we’re just human and we can only drive for so long without our minds, our bodies, and our spirits needing rest”. Upon his return, Repa and staff began articulating what it would look like if we integrated personal and collective wellness into our work – what would it look like if we made an organizational commitment to the nourishment of our whole selves. Nexus’ Wellness Program is a collective experience that promotes valuing individuals and the work they engage in. We believe this should be the way forward for the nonprofit and philanthropic sectors. Valuing the wellness of your staff; valuing the whole person, changes the way they approach the work and the way they show up. It allows those who wish to dedicate their life to social justice, to do so and to do so in such a way that doesn’t sacrifice their minds, bodies, and spirits. Nexus staff enjoying a wellness cruise on the St. Croix River. Nexus’ Wellness Program is unique in its approach, being both flexible and responsive to the personal wellness practices of the staff. Nexus’ Wellness Program is a human based approach that reinforces the importance of self-care. Since wellness practices look different for everyone, Nexus staff decide the activities that are suitable to their mental, physical and/or spiritual needs and interests. Nexus’ Wellness Program includes a $250 wellness stipend every six months and two paid wellness hours per week which are blocked off on calendars and used for activities defined by individual staff. 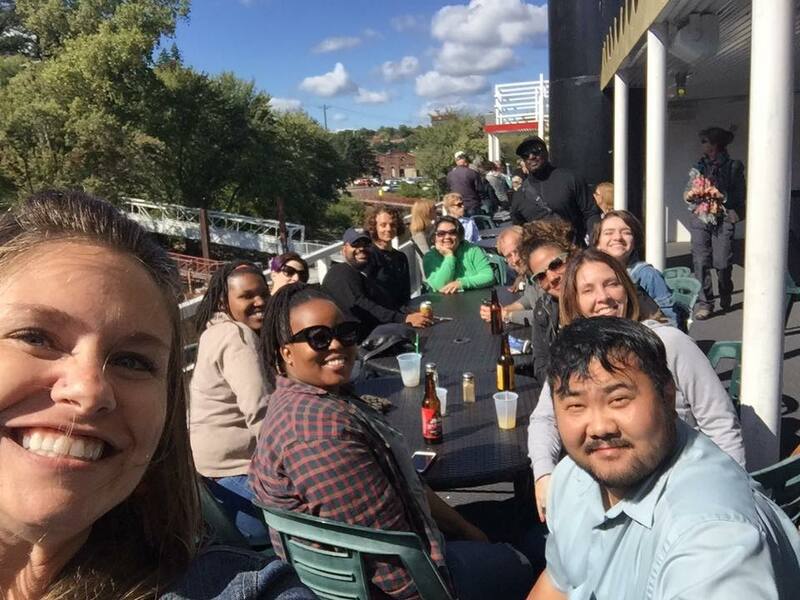 In addition, Nexus staff participates in a collective wellness activity such as group meditation instruction, a boat cruise, a trip to the Como Conservatory, and a self-defense class led by a Nexus staff member. The group time provides a space for Nexus staff to engage and experience each other while strengthening relationships. We believe that our wellness practices are necessary. As an organization led by people of color and working in communities of color, we know the toll this work can take on our minds, bodies, and spirits. At Nexus, we welcome the whole person into the work and believe that our passion and dedication to the work should be valued. We believe a person can step away from their work to take care of them self and their work is better for it when they return. Allocating financial resources for wellness reinforces the value we place on the mental, physical, and spiritual wellness of the staff. Unfortunately, too many nonprofits overwork their staff and send the message that taking time off, taking care of oneself and/or your family, means you’re not fully committed to the work. Foundations, too, can create and/or perpetuate this culture by refusing to pay adequate overhead, asking for “efficiencies” in staffing, and looking for long-term change in short-term grant cycles. The result? Burnout – a loss of dedicated, passionate and compassionate individuals who are no longer able to contribute their skills and expertise to the work. Repa’s sabbatical was an important time for the organization and a wonderful opportunity for us to reflect on how we are sustaining ourselves in this work. We encourage other organizations to think deeply about how they’re taking care of themselves while working to advance social justice throughout our communities. To learn more about Nexus’ Wellness Program, contact Theresa Gardella at tgardella@nexuscp.org or Felicia Ring at fring@nexuscp.org. Congratulations to Our Partners on Winning the 2017 Bush Prize! Nexus is proud and excited to share that three of our community partners are receiving the 2017 Bush Prize for Community Innovation! Congratulations to Appetite for Change, the Hmong American Farmers Association and the Latino Economic Development Center for the well-deserved recognition and added capacity for all your amazing work in community! 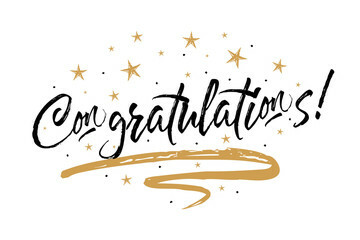 “Now in its fifth year, the Bush Prize celebrates organizations that are extraordinary not only in what they do but in how they do it. As models of true problem solving, they work inclusively, in partnership with others, to make their communities better for all. Read the entire announcement and learn about all seven 2017 Bush Prize winners from the Bush Foundation here. 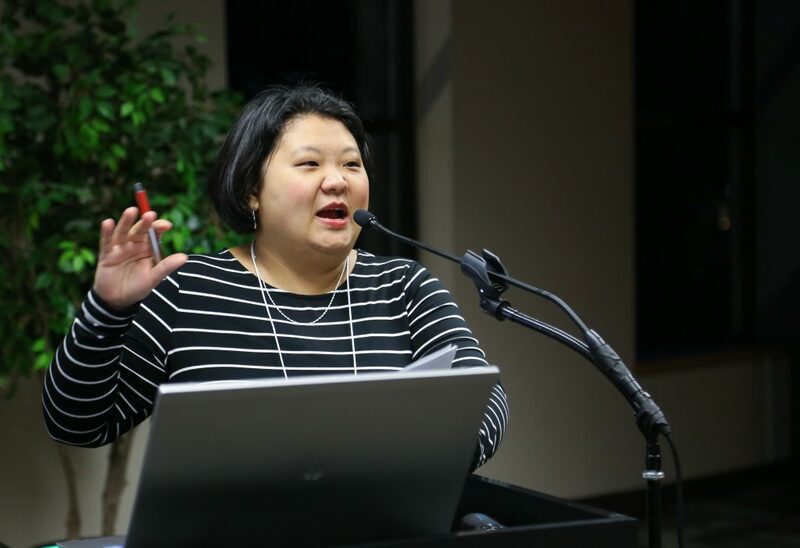 Boards and Commissions Leadership Institute (BCLI) Program Director Terri Thao and BCLI Alumna Sonya Lewis are hitting the road to help the State of MN promote the state boards and commissions! Come to an upcoming information session in your region between now and December 14th to learn more about how you can connect, engage and participate in the policy decisions that impact YOU by serving on a state board, commission or task force! Click here to register for one of the information sessions! Who should come? Anyone who is interested in learning about civic engagement, certainly young adults (18+) interested in learning more about this topic. Why come? Learn about what opportunities are available to participate in and affect change at the state level. What do state boards and commissions do? We are at a critical moment in history. At the same time the trend in disparities threatens our economic vitality, the unprecedented wave of baby boomer retirements could further entrench the wealth gap. Nationally, approximately 50% of privately held businesses are owned by baby boomers, with 85% of owners having no succes­sion plan.4 One-third of business owners over the age of 50 report having difficulty finding some­one to purchase their business.5 This could result in the loss of millions of jobs, billions in tax reve­nue; leading to significant economic instability. But the ‘silver tsunami’ doesn’t have to be an eco­nomic disaster. The trend could actually provide opportunities to mitigate wealth disparities and root ownership in communities of color. Across the country, the strategy of converting business­es to worker cooperatives is gaining traction as a means to redefine the traditional notion of ownership and build community wealth. In the worker cooperative business model, employees become the new owners; sharing the profits, ac­cumulating wealth, and participating in decision making through a one worker, one vote structure. Worker cooperatives offer a way to promote local and broad-based ownership, provide dignified employment and eliminate racial and economic disparities. In 2016, Nexus Community Partners and the Center for Urban and Regional Affairs (CURA) at the University of Minnesota began conducting a landscape analysis to assess the potential impact on our local economy and to identify potential opportunities for conversions to worker coop­eratives. What follows are the results, a case for worker cooperatives and a set of recommenda­tions for how the Twin Cities region can support the growth of the cooperative sector in commu­nities of color. Click here to continue reading the Impact Brief: Business Conversions to Worker Cooperatives. This workshop series is designed to deepen your knowledge, broaden your perspective, and sharpen your skills as you explore the potential for community engagement to create equitable, healthy, and sustainable communities. The sessions are for anyone who is interested in learning more about community engagement, or for those who wish to deepen their work with community. Session 1: What is Community Engagement? Why is it Important? Understand the principles and values of community engagement and how it differs from other practices, such as outreach and the traditional social service model. Learn how community engagement can make your work more effective. Utilize community engagement tools for building relationships, leadership, and ownership. Explore how community engagement leads to equity and how understanding equity is essential for effective community engagement. Assess your organization’s readiness and capacity to incorporate community engagement as an approach in your work. Fee: A few scholarships are available, no one will be turned away for inability to pay. Contact Angie for details (see below). NOTE: Attendance at all four sessions is required, as this is a cohort experience and each session builds upon previous sessions. **Please do not register for more than 5 participants from one organization** – this is to ensure a mix of participants from various sectors and backgrounds for a rich, dynamic experience. Please contact us if you have any questions or concerns about this requirement. About Nexus’ Community Engagement Institute: Nexus’ Community Engagement Institute (NCEI) is an initiative designed to advance and strengthen communities through equity-based community engagement, both locally and nationally. Click here to learn more about our work. Facilitators and Presenters: The presenters and facilitators are staff and partners of Nexus Community Partners and Nexus’ Community Engagement Institute, which is continuing the work of the Building the Field of Community Engagement collaborative (BTF). Please forward this invitation to anyone who might be interested. Contact Angie Brown at abrown@nexuscp.org with questions or for more information about scholarships. Nexus welcomes new staff member Chalonne Wilson! We are excited to have Chalonne join the Nexus family! 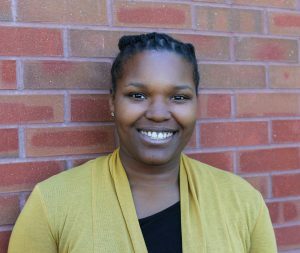 She joined Nexus in July 2017 as the Program Coordinator of the Evaluation Fellows Program (EFP), which is part of the Community Engagement Institute in partnership with the Minnesota Evaluation Studies Institute at the University of MN. The EFP is designed for community engagement practitioners, evaluators, and funders to collaboratively explore the overlap of community engagement and program evaluation. Chalonne works closely with the EFP Advisory Group, the director of Nexus’s Community Engagement Institute, and the director of the Minnesota Evaluation Studies Institute to develop and support programming and serve as a key resource for Fellows in the program. Please help us welcome Chalonne! Nexus Community Partners seeks a part time Finance and HR Associate (20 hours a week). 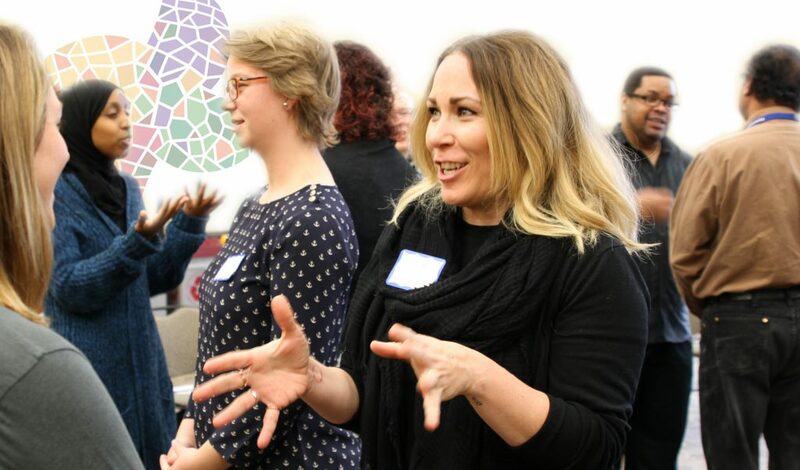 Nexus Community Partners is a nonprofit organization dedicated to building community wealth & power and advancing racial equity in the Twin Cities. Nexus is an intermediary whose mission is to “build more engaged and powerful communities of color by supporting community-building initiatives and foster social and human capital.” Nexus is all about building community through relationships: between community-based organizations, the public sector, and other nonprofits and funders. We work to make sure that communities of color are at the forefront of making decisions that impact them and that they have the power and tools to generate and maintain wealth. Nexus’ Administrative team is responsible for ensuring that the operations of the organization run effectively and in a manner reflective of our values. Assist with administering PTO including following up with Nexus staff and updating the tracking spreadsheet. Assist the Director of Finance and HR in the areas of the Wellness program, organizing staff learning opportunities, and the staff review process. Function effectively as a leader, team member, and problem solver in order to ensure that the goals and objectives of Nexus are met. Help build organizational capacity, including strategizing around organizational or program development, developing documentation, supporting communications, and participating in professional development trainings. Experience working in A/P and/or A/R a plus. The ideal candidate would be able to start October 2017.